Robert Mason Brown, III, 40, passed away unexpectedly on Monday, January 7, 2019 at home. Mason grew up in Roanoke, VA and graduated from North Cross School. He played football in high school and at Hampden- Sydney College where he proudly wore the # 41. 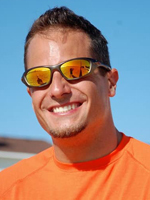 He was a personal trainer at the YMCA and was loved by his many clients. He was always generous of himself and never met a stranger. Mason’s smile was infectious and he was often described as a kind soul. He was an avid Redskin fan and a member of St Andrews Episcopal Church. Mason was preceded in death by his grandfathers, Samuel Edmund Waddill, Jr., and Robert Brown, Sr. and his grandmother, Betty Jane Brown.He is survived by his mother, Anne Waddill Brown and his father, Robert Mason “Buster” Brown, Jr. both of Newport News; his grandmother, Mary Randolph Scott Waddill of Newport News; his best buddy, his german shepherd, Rommel and many extended family and friends. A Memorial Service Celebrating Mason’s life will be held on Wednesday, January 23, 2019 at 1:00p.m. at St Andrew’s Episcopal Church. The family will receive friends following the service. Contributions may be made in Mason’s memory to Youth Challenge, P.O. Box 543, NN, VA 23607. Arrangements by Weymouth Funeral Home.